Since 2009 all four of these factors have been working in unison to create an environment where stocks in the United States rose from 666 on the S&P 500 to 2066 this morning. As we will discuss below, it is likely the four components above will turn negative, in unison, and become a headwind for U.S. stock prices moving forward. We are currently in the second longest bull market for U.S. stocks in history. Earlier this month we tied and have now passed the run from 1949 to 1956. 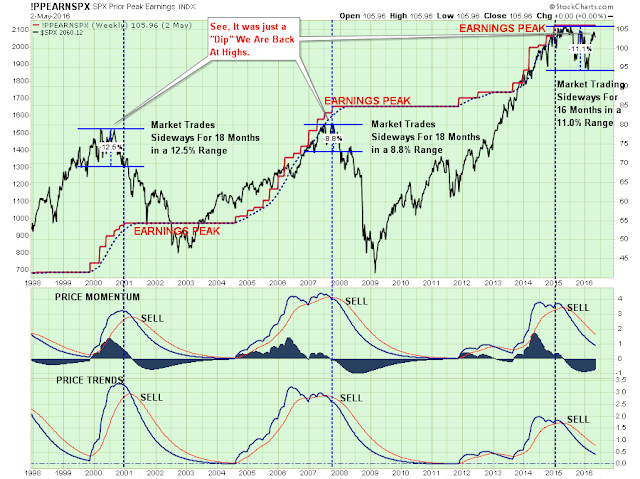 The only longer run was the 1990's bull market mania. A bull market is considered over when stocks fall 20% from their peak. Recessions are officially announced by the NBER months after they have already begun because they need time to formulate the data set to show a recession has arrived. The last recession began in December of 2007, but it was not formally announced by the NBER until December of 2008; a full year after it began. The chart below shows the monthly lag from the actual start of a recession from when it was announced along with the S&P 500 (blue line). As you can see, if you waited for the formal announcement (yellow triangles) during the last two recessions the stock market had already priced in the economic weakness and was close to bottoming. For this reason, investors must study and follow leading economic data to try and determine when the economy is rolling over in real time if they hope to use the information to help balance their portfolio allocation to stocks. Reviewing every single economic data point is beyond the scope of this discussion, but for an excellent visual walk-through I would highly recommend the following article; Economy In Pictures: Weakness Continues. The data is showing the leading economic indicators have already entered into a period of across the board weakness. The legendary hedge fund manager Stanley Druckenmiller gave a presentation this month at the 2016 Sohn Conference which caught the attention of many market observers. 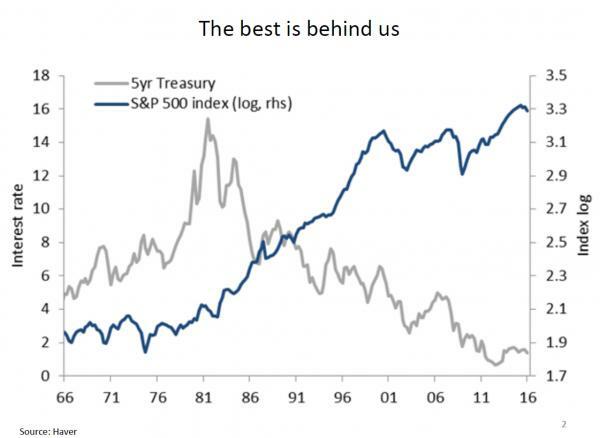 The following chart from The Endgame presentation shows we have been in a harmonious environment of rising stock prices and falling bond yields since 1981. Falling interest rates contribute to rising stock prices by allowing corporations, consumers, and the government to borrow cheaper money. Druckenmiller believes we are approaching, or have already reached the point, where the best may be behind us in terms of stock and bond returns. Stock prices have the ability to continue to rise in price even after earnings and profits reach their peak (as they have since 2014; see chart above). What this requires is investors willing to pay a higher and higher price for earnings, which can be measured with the price to earnings ratio. Historically, the higher prices go without the support of underlying fundamentals (earnings), the more dangerous stocks become and the more likely they are to fall (and/or crash) back to reality. Price to earnings ratios essentially reflect the level of buyers optimism or sentiment toward stocks. If stocks are loved investors will pay more for earnings. If they are hated then they will pay less. The following charts show how much investors have been willing to pay for earnings since 2011 in both the United States and the Eurozone. Stock market returns have been driven by euphoria, not earnings. 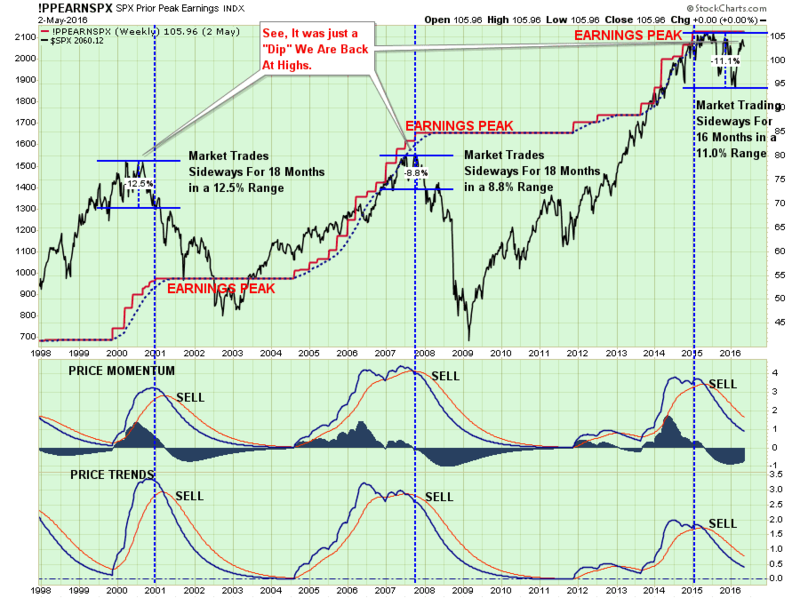 Stocks become the most dangerous to own when you enter an economic recession while the price to earnings ratio is high. During an economic contraction earnings, profits and sentiment tend to fall simultaneously. 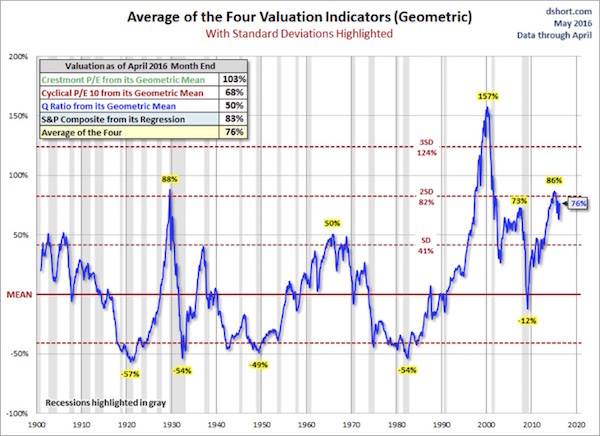 The following graph shows the historical U.S. stock market valuation using the average of four major value indicators. 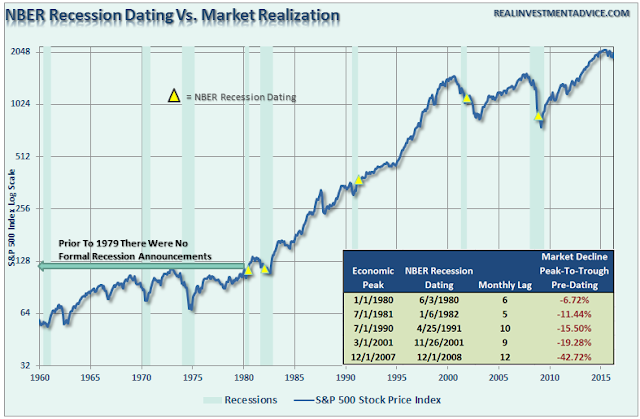 If we entered a recession today we would do so at 76% above the average valuation mean. This would be the second highest valuation point in history entering a recession. What happened to stock prices during previous periods where stock valuations were high and the economy entered recession? The next graph provides the answers. 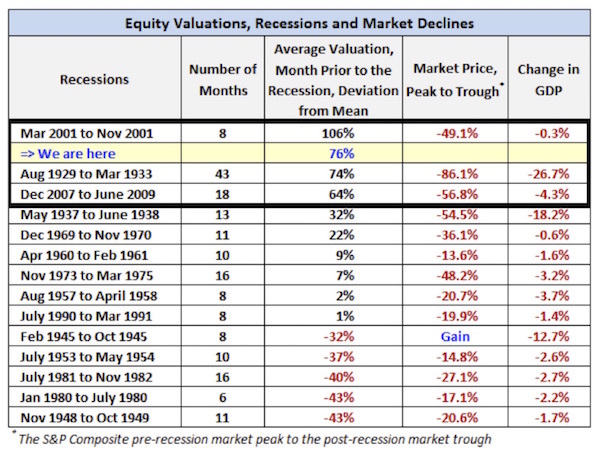 The market price declines during these periods have not been pleasant. "It’s time to add stock buybacks to the long list of bubbles beginning to pop. U.S. corporations announced just $244 billion in planned buybacks during the first four months of 2016. That was a hefty 38% plunge from a year earlier, the biggest drop since 2009, according to Bloomberg. Why does that matter for the broad market? Because companies have been the biggest equity buyers over the past several years, snapping up more than $2 trillion of their own shares since 2009. Without that buying power to prop them up, stocks look vulnerable." U.S. stocks are resting at a dangerously high price to earnings valuation level at a time when the economic data is rolling over and profits have been in decline for 16 months. While this time could be different, history has shown investors should be cautious toward over weighting U.S. stock ownership during this type of environment.